Veedu, the complete magazine which is dedicated to home and interior has published its August 2014 edition. Like its previous editions, the current issue of the magazine is tightly packed with interesting content ready to serve the readers. The August issue of 'Veedu' is having a wonderful reservoir of plans, articles and tips on homes. 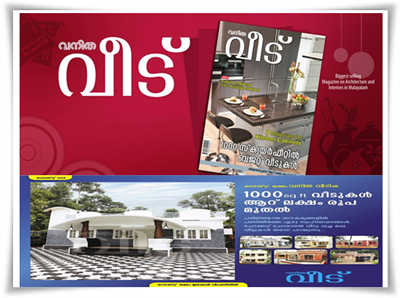 The current edition of Veedu features articles on houses which can be built in limited budget. An exclusive article into the house of Sevenraj will keep the readers intact. The 1000sq.ft houses with a budget of Rs 6 lakhs with detailed description is given in the magazine. 7 homes which has been build at very compromise budget would be useful for those wish to own house without spending much money. The article is worth for reading as it gives an insight about how to limit money and save unwanted expenses. As the cost of building a house cannot be managed by a common man, this novel feature would substantiate the need of many readers. The attraction of this issue will be an interesting story of Sevenraj, a trusted real estate agent. Being a member of a Malayali family, he was born and brought up at Bangluru as the 7th son to his parents; he was addicted to the colours red and white from his childhood. In an exclusive chat with Seven Raj and his family, more exciting facts about his home in red and white is revealed before the readers. The beautiful home and other buildings owned by Seven Raj is creamed with only red and white. The family wears only the two colours which keep them different among the crowd. Right from his house door to the toilet, all gadgets and home appliances are a combination of red and white. He wishes to get recognized like MGR's personality of identification like dark glasses and white cap and Mahatma Gandhi's recognition with his glasses with bare torso with a white towel. Many other inventive articles featured in the August issue would serve useful for the reading community. Compiled by experts, 'Veedu' covers every aspect of building a home, modernizing or beautifying it. This magazine can serve as a companion for those who wish to live the contemporary life style. From choosing a plan and even deciding the architect to design the kitchen, the magazine would be a perfect its purpose. This issue of Veedu can be kept as a collector's edition for its incredible plans and majestic articles. Designed with perfection, the magazine comes with the most stylish multi colour design.